Home / Original title page for the first Latin edition of the Meditationes de prima philosophiaby René Descartes, 1641. 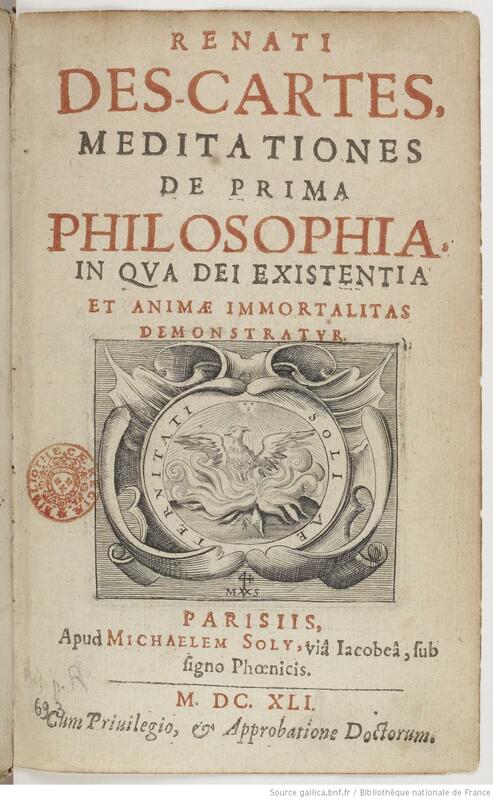 Original title page for the first Latin edition of the Meditationes de prima philosophiaby René Descartes, 1641. René Descartes, who lived from 1596 to 1650, was a supremely influential figure in the histories of philosophy, science, mathematics, and music. His groundbreaking work in rationalist philosophical methodology, epitomized in his Discourse on Method and his Meditations on First Philosophy, has resulted in Descartes’s popular status as the ‘Father of Modern Philosophy.’ Hobbes interacted and corresponded with Descartes during his 1640-1651 sojourn in Paris, when he had fled England in fear of persecution from the anti-Royalist forces who were then in ascendancy in England. At the request of the French Philosopher, Marin Marsenne, Hobbes wrote a series of Objections to Descartes’ Meditations, which were published with other objections and Descartes’s replies in 1641. In his objections, Hobbes primarily critiqued what he took to be the scholastic assumptions that pervaded Descartes’ dualist metaphysics of substance. Despite these differences, the two thinkers shared much common ground with respect to the mechanical understanding of physics.